I have kids, so I’ve seen and read A LOT of Harry Potter over the years. A favourite scene that sticks in my mind is in the first movie, when Harry visits Ollivander’s Wand Shop to buy his wand before the start of school. Ollivander is a wise old fellow who has hundreds of boxes stacked up row upon row in all the nooks and crannies of his shop. Frankly, the place is a bit of a mess. 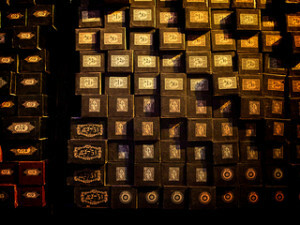 But Ollivander knows where everything is and knows about the origins, characteristics and special powers of each wand. His job is to expertly size up the young witch or wizard and then choose a wand for them – the perfect tool that will allow them to fulfill their magical destiny. When he presents Harry with his special wand, the sparks really fly. I’m no Ollivander, but I do see similarities between what he does and my role in Knowledge Translation. As a communicator who has worked in health care and health research for almost 20 years, I have a lot of “stuff” stacked in my brain. Media, stakeholder relations, messaging, speechwriting, video, social media, government relations, publications – it’s all in there. Sometimes, the place is a bit of a mess. But just like Ollivander would never reach for the same wand for every student who wanders into the shop, the selection of tools for a KT project should never be automatic (oh hi, social media!). Before you do anything, you really need to size up the witch or wizard before you. KT strategy is about really understanding your stakeholders and then acting upon that knowledge by engaging with them on their terms. It means developing messages that speak to their needs, not yours. It’s about making the effort to connect with them in a way that works in their world. This could mean providing a lay-friendly orientation package for a new member of your advisory group, a by-the-book briefing note to a government stakeholder, or a short video that captures the emotional impact of a patient story. If you know that your stakeholders are on social media, it could even mean developing a targeted and sustainable SM strategy. You need to think before you do. If you’re not bringing strategy to the table, you’re a lot less likely to find the magical outcomes that come from selecting appropriate, audience-specific tools. Instead, you may find yourself simply waving around a crappy brown stick that will never produce sparks. Photo courtesy of Dave Goodman. Alison is a BC-based health communicator and certified Knowledge Translation Professional who works with a variety of health, research and non-profit organizations. She is co-owner of Monkey Hill Health Communications and a co-founder of Knowledge Communicators. This entry was posted in Blog and tagged knowledge mobilization, knowledge translation, KT strategy on November 28, 2013 by Alison Osborne. Your new website requires maintenance. Really. My clients are often surprised when I advise them that their new website needs regular maintenance right from day one. This post explains why. Located in the Child & Family Research Institute at BC Children’s Hospital in Vancouver, the Colin Ross Laboratory investigates the genetic basis for severe adverse drug reactions (ADRs).